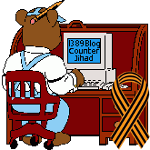 Jewish Task Force (colleagues) — 1389 Blog - Counterjihad! Don’t take jihadi terrorist prisoners in the first place! JEWISH TASK FORCE (JTF) KOSOVO IS SERBIA!